After a spell of wet weather in September, the autumn became dry again and a lot of flowers that had just started into bloom shrivelled up and died. Towards the end of the month, however, the rains returned and the green shoots appeared again. Even up on the Katharo Plateau there had been no rain, and the earth was still very dry and cracked. Even so, there were autumn flowering bulbs everywhere. Sadly, there were also signs of continued building of private homes, with the resulting clearance of the surrounding land to form ‘gardens’. 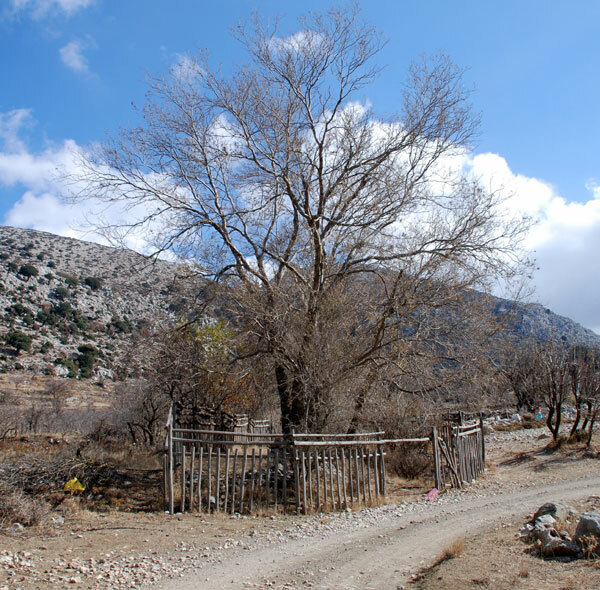 Zelkova abelicea / Αμπελιτσά ανέγνωρο / Zelkovie - Zelkovia is a small, elegant tree which is endemic to Crete. This specimen is on the Katharo Plateau and is one of very few in the east of the island. Scilla (Prospero) autumnalis / Autumn Squill / Σκίλλα η φθινοπωρινή / Herbst-Alraunenwurzel - Scilla autumnalis (the flower formerly know as Prospero) is still in flower in many areas. 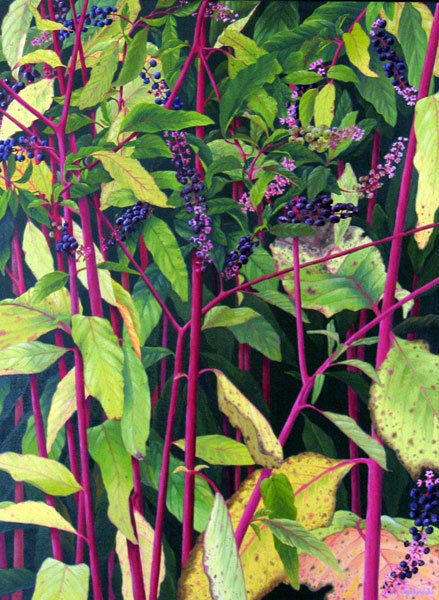 Phytolacca americana / American pokeweed / Φυτολάκα η μερικανική / Kermesbeere - The American Pokeweed features in this painting by Jan Liodaki, comes, of course, from North America. It has self-sown itself along roadsides and in fields across Crete. In autumn it produces tassels of dark black berries. 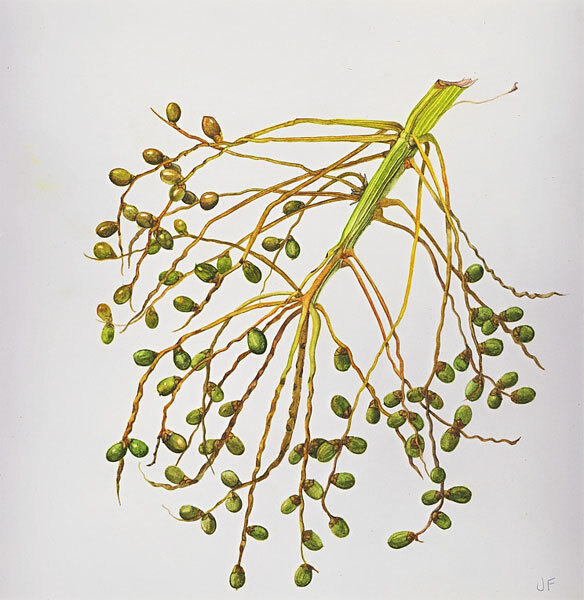 P.theophrasti / Theophrastus’ Date Palm / Φοίνικαζ του θεόφραστου / Kretische Dattelpalme - This watercolour of the fruit of the P. theophrasti was painted by Julia two years ago. It is full of fine detail and shows the ripening dates. Oxalis pres-caprae / Bermuda Buttercup / Ξυνήθρα / Nickender Sauerklee - The Bermuda Buttercup is coming into flower at the moment, after the recent rains. 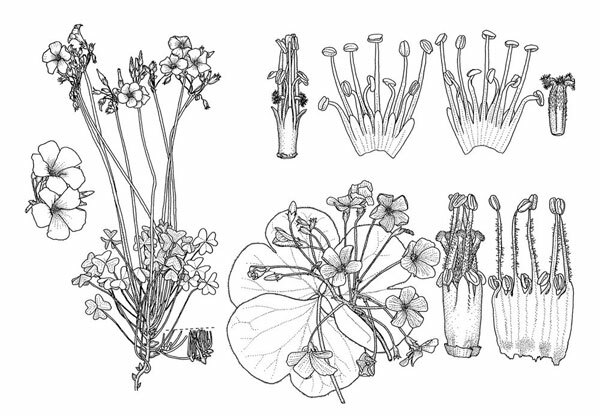 Again a lovely botanic illustration from Hans de Vries. Mystery glasswort - I photographed this near the causeway at Olous this month. 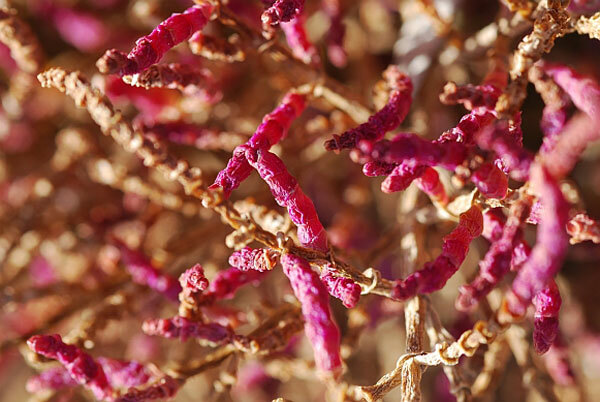 The sandy soil was covered with the plant, which is a beautiful shade of pink. Arthronemum macrostachym, a perennial glasswort ? Katharo Plateau - I have included this photograph of the Katharo Plateau in November for you to enjoy. 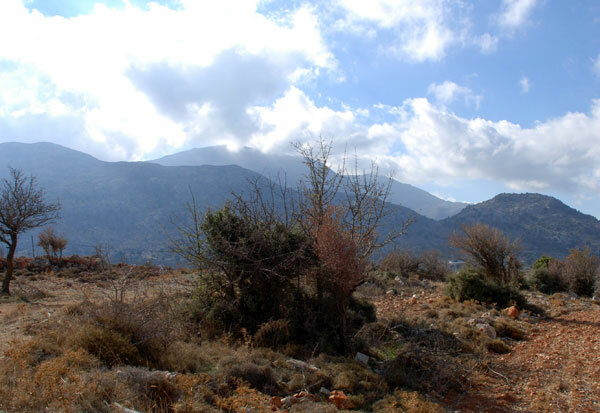 It was such a wonderful day, when I went up to see Yiannis at Zerbas Taverna, that I turned my camera to the landscape. I usually send my time looking at the ground, but when I do look up, I am always stunned by the beauty of the scenes around me. 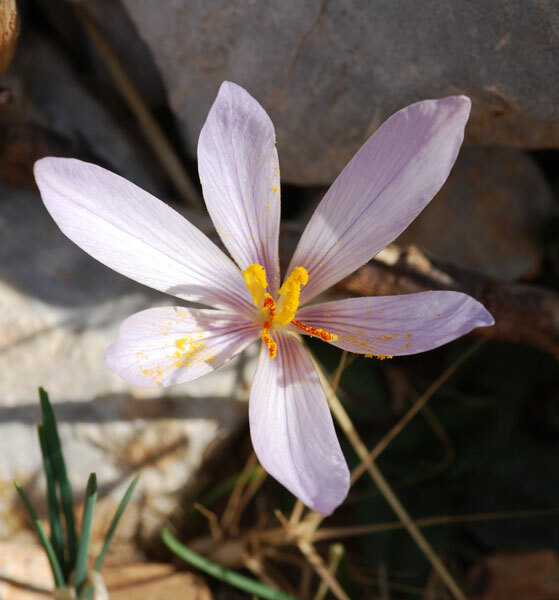 Crocus oreocreticus / Cretan crocus / Κρόκοζ των κρητικών / Kretische Krokus - The superb C. oreocreticus was in bloom everywhere, despite the lack of rain. This year I must have times my trip just right, as I have never seen so many of this species in bloom at the same time – they were everywhere. 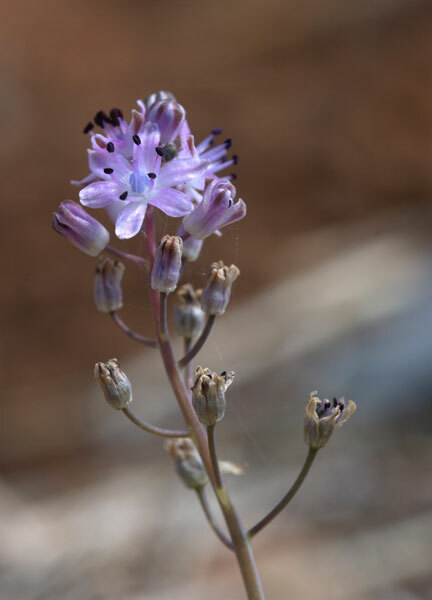 C. oreocreticus is endemic to Crete and is the symbol of Flowers of Crete.